8. If you are assigned with an opportunity, don’t let anyone influence your work. 12. Your competition prevails in every corner of the world. (Lesson Credits: Ashok Mittal Sir) (P.S. He shared an example of a normal shop, LPU, a placement drives, to explain us the concept of Global Competitiveness. The day started normally until I reached LPU. First and foremost, when I was given duty by Nitin Gupta Sir, I got chance to learn from Sarang Sir and Ajay Sharma Sir. 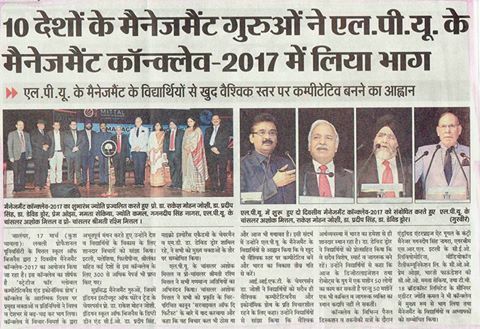 Later in the day, I heard from various Guest Speakers such as Mr. Pradeep Singh, Mr. David, Mr. Rakesh Mohan Joshi, etc. Mr. Pradeep told us about the World Economic Forum, Global Competitive Index Report. 1. Build for the rich: Passe’? 3. Trust your business leaders. 4. Will the rich run or remain? 6. Do people still trust the news? 8. Do people feel they are led well? 9. Are the established strategies effective? 10. Wheel or deal, or rules of steel? 11. Is information the new labour? 12. Is social capital the new capital? 1. From ‘People Orientation’ to ‘Process Orientation’. 2. From ‘One size fits all’ to ‘Mass Customization. 3. From ‘One-time payment’ to Pay as you go’. 4. From ‘Closed Enrollment’ to ‘Open Enrollment’. 1. ‘Too big to fail’ can fail. 2. ‘On demand economy’ uses free information. 3. Managing networks is the new (Social) capital. 4. Consensus replaces hierarchy/monopoly in leveraging networks and free data. 5. Crowd funding replaces capital in production. 6. The rules of engagement at BoP predominates. 1. McDonaldization: The idea here, is that we are shifting towards eating too much Junk Food. In addition, he used one sentence, “Followers cannot be leaders”. I personally hold a different opinion on the same as I feel, “Followers are the future leaders.” Until and unless, we learn from other people, how can we learn to lead without any knowledge and expertise? However, he shared a lot of wisdom, he also told us that the riches person in Britain was born in Rajasthan. 1. You can upgrade yourself by your own self. 3. You are your best friend. 4. You are your worst enemy.